Don't Sell Your Silver Coins Until You Read This Article! As a coin dealer, we regularly meet with customers who are interested in buying and selling various types of silver coins. Our customers tell us that they have no problem finding online resources about purchasing silver coins, but that it is difficult to find anything online regarding the specifics of selling silver coins. So we thought we’d offer this article to highlight some of the most common silver coins that we purchase, how to determine if you have a valuable silver coin, how the coins are typically sold and how to maximize the value of your transaction when you sell silver coins. American silver eagles are some of the most recognized and beautiful government issued silver coins in existence. While they’ve only been minted for 27 years, millions of these coins have been produced, and are in demand by silver investors and coin collectors alike. Historically, only the 1996 silver eagle has been considered a key date coin; however, as of late, the 1986 silver eagle in particular has increased in popularity, and also sells at a higher premium over most other American silver eagle bullion coins. American silver eagle bullion coins are typically sold in rolls of 20 coins. American silver eagle proof coins sell at a much higher premium; typically 1&half; - 2 times the rate of standard American silver eagle bullion coins. Key date American silver eagle proof coins include those minted in 1993 and 1994. American silver eagle proof coins are commonly sold individually with the original government packaging. You can’t have a discussion of the most popular U.S. silver coins without considering Morgan silver dollars, which may be the most beloved American silver coins ever minted. Minted from 1878 - 1904 and again in 1921, Morgan silver dollars are 90% silver coins and contain .774 troy ounces of fine silver. Because these coins contain collectible value in addition to their silver value you should expect to receive more than the melt value when selling silver dollars - especially for key date or uncirculated specimens. Key date silver dollars are lower mintage silver dollars; typically with production values of less than 1,000,000. Additionally, uncirculated silver dollars, even when common date coins, should sell at a premium. All Morgan silver dollars minted in Carson City, which can be identified by a “CC” mint mark, are considered key date coins, as well as most Morgan silver dollars minted from 1893 - 1895. The 1895-P Morgan silver dollar is considered to be the “king of silver dollars,” and sells for five figures even in average circulated condition. 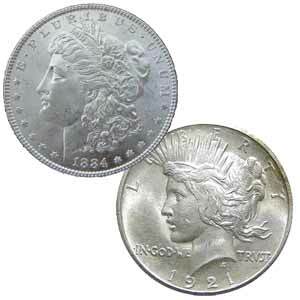 While not quite as popular as Morgan silver dollars, Peace silver dollars are beautiful coins in their own right and sell at a premium over their silver value. Peace silver dollars were first minted in 1921 as a high relief coin, but the mintage of these coins proved to be too difficult, and the U.S. Mint reverted back to standard relief coins the following year. Peace dollars were subsequently minted from 1922 - 1928 and again in 1934 and 1935. The 1921, 1928-P, and 1934-S Peace dollars are the lowest mintage, and subsequently most valuable Peace dollars minted. As with Morgan silver dollars, Peace silver dollars in uncirculated condition sell at a premium over average circulated condition coins. While key date coins are typically sold individually, most common date Peace silver dollars are bought and sold in rolls of 20 coins. We hope that this brief article has provided valuable information that you can use the next time you find yourself needing to sell your silver coins or wondering which silver coins would be the best investment. While these are the four most common types of U.S. silver coins that we see, there are many other silver coins that are highly valuable, so be sure to do your due diligence to ensure that you receive a fair price for your coins.